If you’re in downtown Seattle, you want to take a ferry ride across Elliott Bay on the West Seattle Water Taxi. It whisks you across the bay to within steps of Salty’s and the beach. Just head to Pier 50 on the waterfront and hop on the ferry. After dining at Salty’s, stroll along the 2.5-mile-long beach and be mesmerized by the views of Elliott Bay, the gorgeous Seattle skyline with the cascades behind it. Continue on and eventually you’ll find Puget Sound with views of the snow-topped Olympic Mountains. Be sure to watch for eagles nesting in the trees above the restaurant, Blue Herons, Seals and Sea lions, not to mention giant container ships and Coast Guard Vessels. 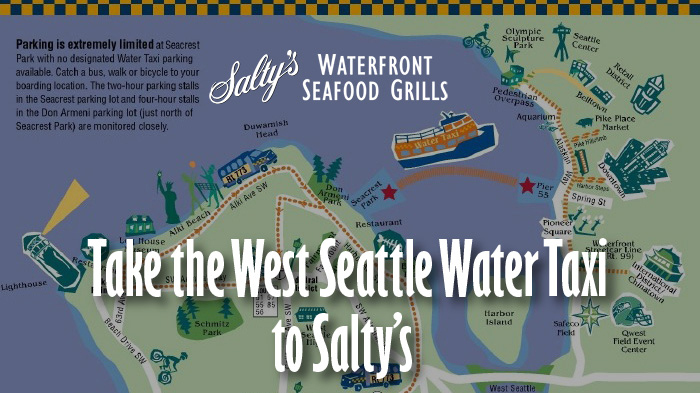 Before you head to Salty’s, check out the West Seattle Water Taxi schedule. Making a reservation is highly recommended.